The Public Hearings for the Citizens’ Inquiry into the Health of the Darling River and Menindee Lakes have now concluded. We thank everyone who came out to speak to the Inquiry panel about their concerns and experiences of living in the Darling River system. Although the Public Hearings have concluded, the Inquiry is still accepting submissions until April 30 via our online form, via post, and via email. See how you can lodge a submission with the Inquiry. 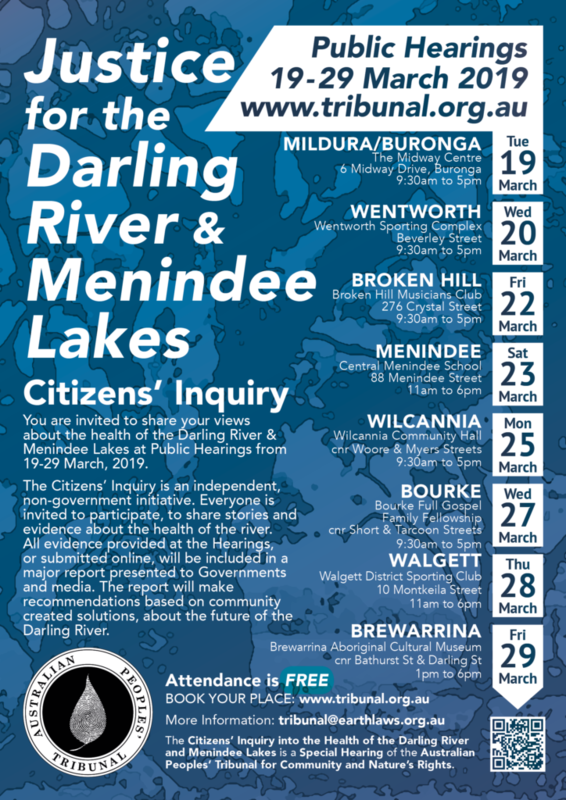 What is the 2019 Citizens’ Inquiry into the Health of the Darling River and Menindee Lakes? Written and pre-recorded testimonies can be submitted any time before 30 April 2019. Click here to submit written or pre-recorded materials via the online form. Please click here to register for a hearing.